'Bambella: It always occurs to me how lovely you look today. It always occurs to me how lovely you look today. One of the things I love the most about DIY is how it makes me feel like a little girl again. From actually making the things, to showing people and saying 'I made it' when they ask where it's from, the whole process makes me like an excitable little child. So when it comes to things like phone covers for example, I didn't decide to make my own purely becasue it's cheaper than buying one (as most phone covers are no more than £5 so it's not as if I couldn't afford to just buy one), it's the feeling of knowing you made it and no one else has one like it which is what spurs me on to DIY. Fortunately, when I bought my phone, it came with 2 spare covers. On one I wanted to glue studs to the back as I'm loving studs on everything at the moment, and on the second I wanted to do some sort of doodle. So I bought some studs on Ebay here (the cheapest I've found), folded in the little arms on the studs so they sat flat on my case, and used super glue to stick them down. Simple! Unfortunately this is the only photo I took of the case before I lost it :( So I apologise about the quality of it as it was only taken on my phone camera, but you get the idea! As I said, for the second case I wanted to do some sort of doodle or illustration on it. I had recently drawn an illustration of a tree for an exhibition which I really liked and thought would look pretty good. So I gave it a go! 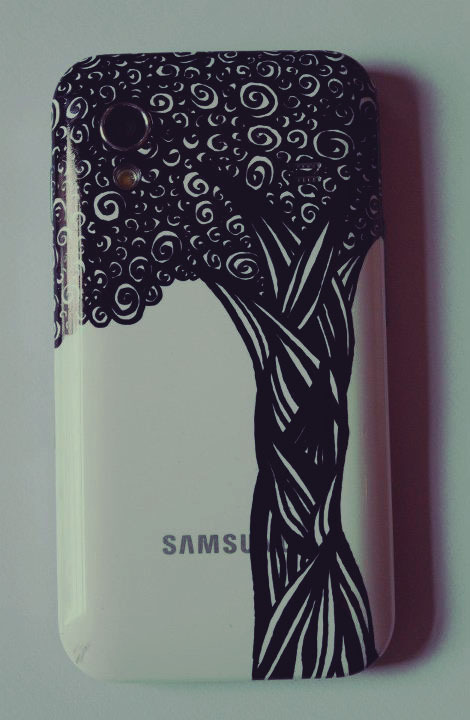 I took the plain white phone cover, used a black Sharpie pen to draw on the design, waited a day or so for it to fully dry and then painted a layer of varnish over it to seal it. I was really pleased with how this one tured out too, and managed to get a better quality picture too! Wow I love the last phone case, you should sell them girl you're extremely talented! Just had a nosy at your facebook page, I adore your illustrations! 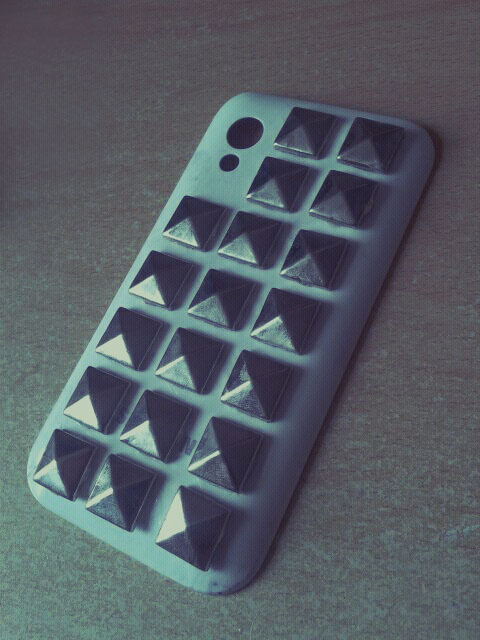 These phone cases look awesome! I wish I had the skills to do little DIY projects like you do. I especially love the last one. Just checked out your illustrations facebook page, this one (https://www.facebook.com/photo.php?fbid=284366648250933&set=a.284366614917603.72258.284032954950969&type=3&theater) is actually amazinggggggggggggg! You've got some talent right there!